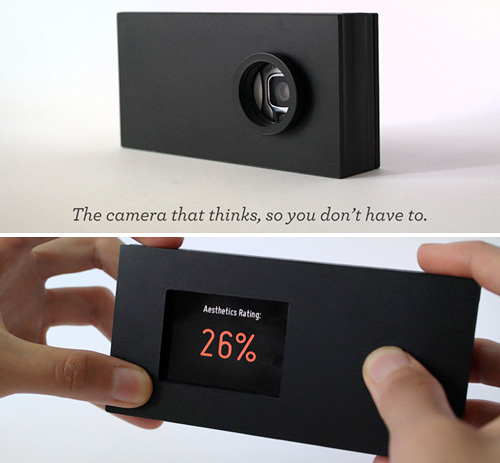 Nadia Digital Camera Lacks Live Preview, Instead Provides An Aesthetics Rating Of What You've Shot | OhGizmo! BEARINGS GLOCKEN Musical Instrument – Does Anyone Remember Animusic? Normally it’s not the camera that makes a good photograph, but the photographer. But the Nadia digital camera, created by Andrew Kupresanin, could turn anyone into an Ansel Adams. Instead of an LCD display showing what you’ve just shot, or even a viewfinder for that matter, the Nadia shows a judgment of the aesthetic qualities of your most recent photo as a percentage. The camera, which is actually a boxed up Nokia N73 communicating with a Mac over Bluetooth, uses the ACQUINE Aesthetic Quality Inference Engine to gauge the merit of your photography. And since Nadia is just a prototype, hopefully future versions will be able to provide real-time feedback so you’ll know the optimal time to snap a photo. Who says the Pulitzer Prize for photography should only be for professionals who know what they’re doing? ← BEARINGS GLOCKEN Musical Instrument – Does Anyone Remember Animusic? I can honestly say this is a waste. With zero real time feed-back. I could see myself just taking tons of photos wasting memory on trying to find that perfect picture. I will give them some credit though. The idea behind the device is very nice. I really do hope for a real time feed-back feature in the future as-well. I suppose this why they have prototypes right? That “aesthetic mode' might succeed as a cool extra feature or as a toy gimmick….. but i'm sorry it makes an actually camera a complete waste if it replaces the viewfinder/screen.